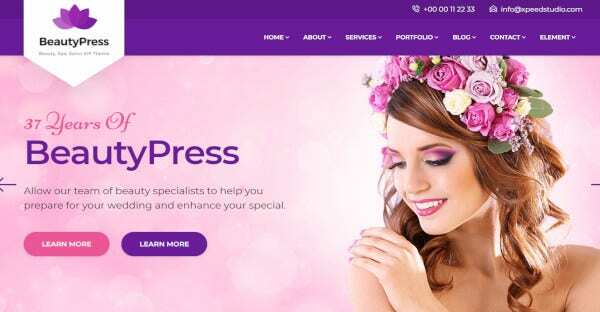 With WordPress being one of the most popular CMS platforms, and for good reasons, website developers and one’s proficient in WordPress have developed several themed website templates. 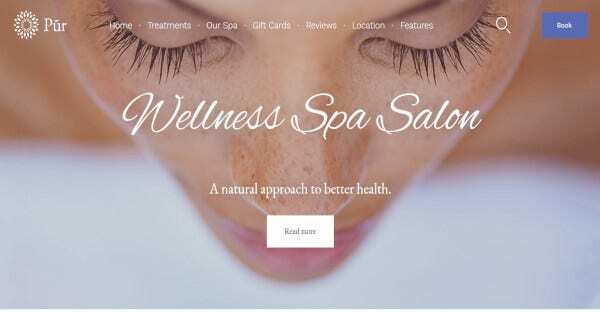 So, if you are a spa owner and you want to promote your business, you ought to have a WordPress website. 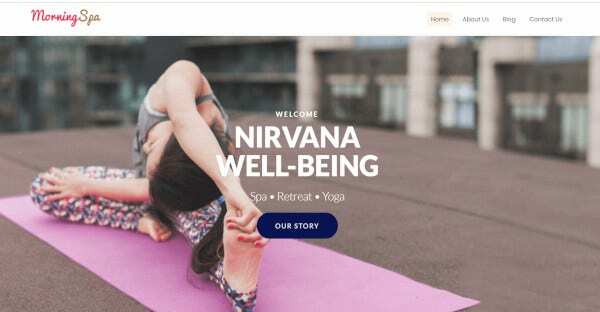 Here are 22 spa WordPress themed websites. The theme is compatible with WordPress 5.0 and up. It comes with 5 different homepage layouts and unlimited color schemes. Appointment booking system has been integrated into the theme for customers to book spa appointments easily. It has 10+ menu style, custom slide, 10+ footer style, and parallax effect. This spa themed website looks as exquisite as it is modern. It comes with integrated Google Analytics to make analysis easier and take business decisions accordingly. A Google map shows your spa’s location on the website. The admin section is incredibly easy to operate. 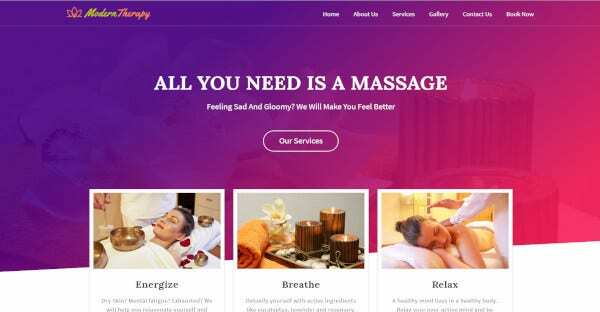 This WordPress theme is suit for beauty, spa, makeup, hair salon, yoga and hair related business. Bleute has several color schemes and layouts to fit the seasons and multiple service styles. It has a detail page for all the services that your spa offers and menu for small services. This beautiful WordPress theme has a very clean user interface and a professional design. It is HTML5 and CSS3 ready also easy to customize. All the fonts, colors, backgrounds can be customized. There is No need for editing code. It is easy to upload your logo without any hassle or knowledge of coding. It is a fully responsive template. Luxury spa is basically for spa centers, massage salons, beauty resorts and any other beauty centers. It provides lots of options to show your business. It has fully included WooCommerce layout where one can sell their skincare cosmetics, beauty products, organic makeup, special spa procedures as well. With this responsive WordPress theme you can customize the theme as per your requirements without having any knowledge about the codec. The theme is developed by CSS3 & HTML5 Code. It is built with bootstrap and is extremely SEO friendly. The code is valid and well documented and comes with Google Fonts integration. 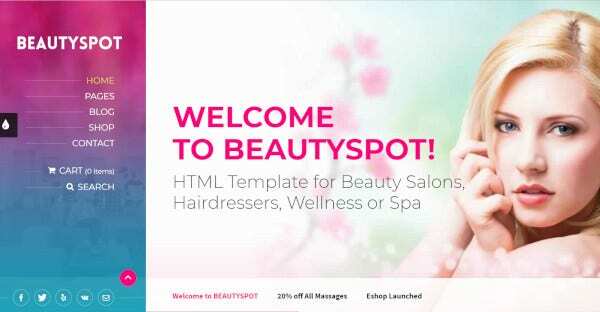 The theme is perfect for your beauty spa business. It is flexible in the sense that you can easily customize and adjust the theme with visual composer page builder. The interface is intuitive. It has 4 color schemes, 2 nice header layouts, 2 services listing layouts and has REDUX powered theme options. The theme is WPML certified and has a fully responsive layout. You can edit the whole website, and the theme has a custom post types feature and post formats. It comes with different shortcodes and is search engine optimized. You get 24/7 support and free updates. 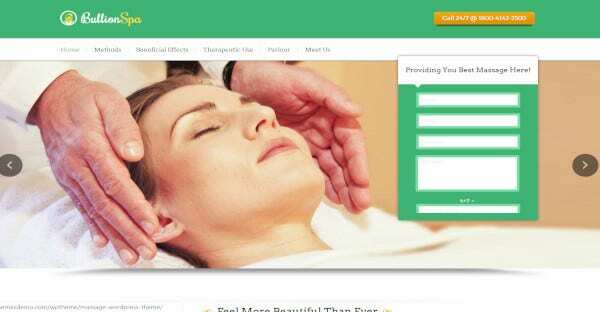 It’s an exotic spa and beauty WordPress theme for beauty therapy, massage, spa, and hair care. It facilitates fixing appointments for spa and massage. It also allows the selling of spa products and creams due to the WooCommerce plugin. It provides an eye-catching catalog of products and their specifications in a blog layout. It is a WordPress 5 version theme with drag and drop page builder. The theme is Gutenberg ready. The theme is mobile friendly with mobile first paradigm at use. The whole layout is 100% responsive and includes some amazing plugins. The theme also includes Jet plugins. The design is sleek, and the website user interface is clean. It is a one-page theme. The entire layout is responsive and is made with HTML5 and CSS code. The theme is developed to load super fast and is search engine friendly. There are several color schemes to choose from. With multiple layout options for customization, this website is created with drag and drop page builder. To increase functionality, this theme has several widgets included like a simple slider, social media widgets, post carousel, etc. You can customize your website easily with WordPress live customizer. This One page Spa landing WordPress theme is highly responsive and search engine friendly. The basic colors used in this theme which gives it a very girlish and youthful look perfect for a spa website. There is a contact page and a gallery page to upload the high definition photos of your spa. The theme is made with unique drag and drop page builder. The theme has a sleek modern look which is eye-catching. With multiple layout options, you are sure to find the layout you want and customize your website. Content modules allow you to customize your website further. The ultra-responsive designed theme has drag and drop facility. The theme comes ready with 300+ retina ready icons. Uploading logo is made super easy. The theme is search engine optimized, has 600+ google webfonts and 100+ shortcodes. The colors of this theme are unlimited. The website is built with powerful drag and drop builder. It includes custom widget, color customization, testimonial section, different styling options and many more. There are a number of layouts available to choose from. There is an in-built library where you can add your favorite layouts and creating a shortcut. 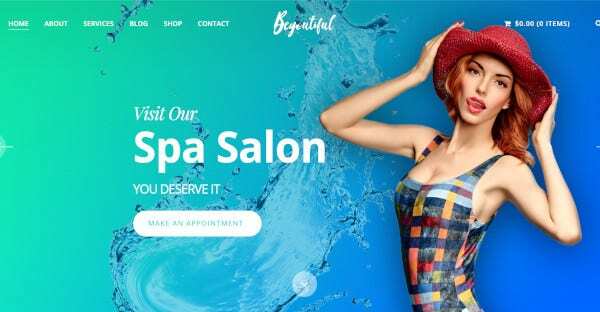 This amazing looking spa and salon WordPress theme has many useful features to enhance its functionality. The theme is suitable for health and spa resorts, salons, yoga centers and other spa related sites. It comes with several important modules and widgets to help you better showcase your spa. The theme is fluid responsive and has and drags and drop editor. 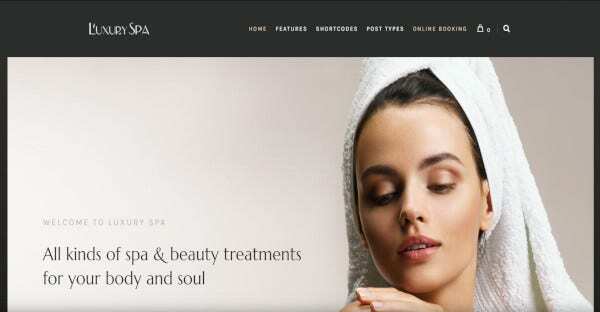 With this multilingual WordPress theme you can easily create a website for spa or beauty related business. It is easy to adjust the colors, layouts, fonts, and headers from the admin panel. The theme comes with several widgets like google maps, comment sections, booking system, etc. It also has a blog layout. 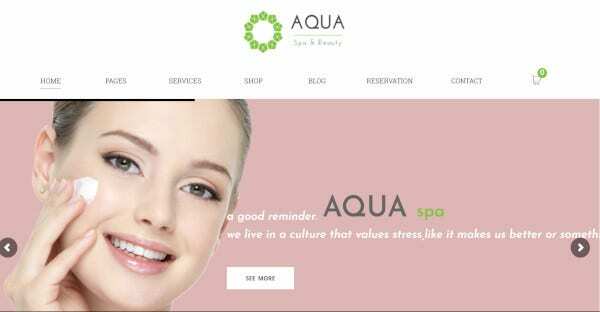 The aqua spa theme is fully responsive. It is retina ready, and HTML5 and CSS3 offer some amazing animations. So the theme is visually pleasing. It is compatible with Gutenberg, and the current version is 3.1.8. It has 12+ homepage layouts. Looks are important to everybody especially their face. Everyone wants clear porcelain skin. So this website is perfect for you to bring in customers to your skincare and spa website. It is super-fast loading theme with cross-browser compatibility. It also has a blog layout where you can blog your thoughts or skincare tips. Editing layout and content is a breeze with different sliders and gallery options. 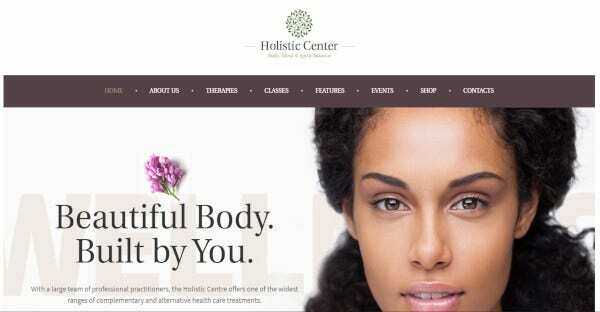 The theme is best for beauty centers, yoga studios, and spa therapy business. It has a built-in mobile version and many modules and widgets. You can get lots of advantages like Easy Installation, customizable, responsiveness and SEO ready theme. This WordPress theme will appeal to those who prefer a minimal design with all the functionalities. The theme boasts custom templates and browser compatibility, easy editing feature and built-in mobile version. It is cross-browser and search engine friendly. The easy editing of content and the layout is an added bonus for those lacking code skills. If you own a salon and spa business, it is vital that you have a website which contains all the information regarding the location of the spa, how to book, booking charges and all the services that you provide to your customers. It is old school now to give out flyers and pamphlets.